What side effects are associated with VNS? What happens during VNS? How is it performed? What are the risks of VNS? What are the benefits of VNS? The vagus nerve is the 10th cranial nerve that supplies motor (muscle) nerve fibers to the throat, larynx, trachea, lungs, heart, esophagus and intestinal tract; it also sends sensory information back to the brain from the ear, tongue, pharynx and larynx. There are two vagus nerves on each side of your body that run from the brainstem to the abdomen. Vagus nerve stimulation (VNS) is a technique that involves implanting a pacemaker-like device that generates pulse of electricity to stimulate vagus nerve. When at home yoga, deep breathing exercises and/or medications fail to treat epilepsy, seizures, anxiety and/or depression, VNS therapy may be considered. VNS is performed on the individual under general anesthesia; the device, about the size of a silver dollar, is placed under the skin in the upper part of the chest with the connector wire run under the skin from the device to electrode attached to the vagus nerve and programmed according to the needs of the individual patient. Side effects usually occur only during nerve simulation, are mild and decrease over time. The risks of VNS include injury to the vagus nerve, nearby blood vessels (carotid artery, jugular vein), other bleeding problems (hematomas), allergic reaction and infection. The benefits of VNS include a reduction in the frequency of seizures and/or less medication with anti-seizure drugs; it also may help regulate depression symptoms. VNS treatments have been used to treat refractory epilepsy and to treat resistant depression. Right sided cervical VNS has been used to treat heart failure in clinical trials. Headaches, migraine headaches and other problems have been studied in small clinical studies. Long-term safety (25-year review in Sweden) study suggests that VNS has a complication rate of about 2% which means it’s a relatively safe procedure according to researchers. The vagus nerve is a nerve that supply nerve fibers to the pharynx (throat), larynx (voice box), trachea (windpipe), lungs, heart, esophagus, and intestinal tract, as far as the transverse portion of the colon. The vagus nerve also brings sensory information back to the brain from the ear, tongue, pharynx, and larynx. The vagus nerve is the tenth cranial nerve. It originates in the medulla oblongata, a part of the brain stem, and extends all the way down from the brain stem to the colon. Complete interruption of the vagus nerve causes a characteristic syndrome in which the soft palate droops on the side where damage occurred, and the gag reflex is also lost on that side. The voice is hoarse and nasal, and the vocal cord on the affected side is immobile. The result is difficulty swallowing (dysphagia) and speaking (dysphonia). The vagus nerve has several important branches, including the recurrent laryngeal nerve. Some cranial nerves bring information from the senses (like touch or sight) to the brain (sensory) and some control muscles (motor). Other cranial nerves, like the vagus, have both motor and sensory functions. The vagus nerve serves many organs and structures, including the larynx (voice box), lungs, heart and gastrointestinal tract. What are the side effects of VNS? Usually, these occur only when the nerve is being stimulated, and are generally mild and tend to go away over time. When is VNS used to treat epilepsy? Brain cells communicate by sending electrical signals in an orderly pattern. In people with epilepsy, this pattern is sometimes disrupted due either to an injury or the person's genetic make-up, causing brain cells to emit signals in an uncontrolled fashion. This creates over-excitement, somewhat like an electrical overload in the brain, leading to seizures. 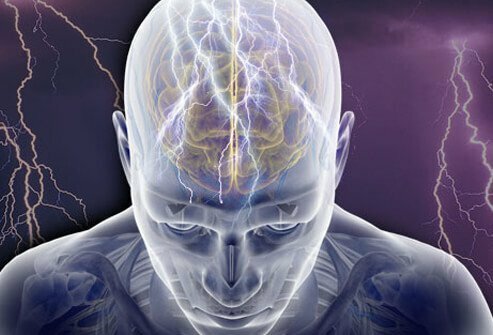 Seizures can be produced by electrical impulses from throughout the brain, called generalized seizures, or from a small area of the brain, called partial seizures. Most people with epilepsy can control their seizures with medications called anti-convulsant or anti-seizure drugs. About 20% of people with epilepsy do not respond to anti-seizure medications. In some cases, surgery to remove the part of the brain causing the seizures may be used. VNS may be a treatment option for people whose seizures are not controlled by anti-seizure medications and who are not considered good candidates for surgery; for example, if their seizures are produced throughout the brain (generalized). It is not known exactly how VNS works. It is known, however, that the vagus nerve is an important pathway to the brain. It is thought that by stimulating the vagus nerve, electrical energy is discharged upward into a wide area of the brain, disrupting the abnormal brain activity responsible for seizures. Another theory suggests that stimulating the vagus nerve causes the release of special brain chemicals that decrease seizure activity. While the patient is asleep (general anesthesia), the stimulator device (that is about the size of a silver dollar) is surgically placed under the skin in the upper part of the chest. A connecting wire is run under the skin from the stimulator to an electrode that is attached to the vagus nerve, which is accessible through a small incision (cut) in the neck. After it is implanted, the stimulator is programmed using a computer to generate pulses of electricity at regular intervals, depending on the patient's tolerance. For example, the device may be programmed to stimulate the nerve for 30 seconds every five minutes. The settings on the device are adjustable, and the electrical current is gradually increased as the patient's tolerance increases. Re-programming the stimulator can be done in the doctor's office. The patient also is given a hand-held magnet, which when brought near the stimulator, can generate an immediate current of electricity to stop a seizure in progress or reduce the severity of the seizure. VNS is an add-on therapy, which means it is used in addition to another type of treatment. Patients who undergo VNS continue to take their seizure medications. In some cases, however, it may be possible to reduce the dosage of medication. The risks of VNS include injury to the vagus nerve or nearby blood vessels, including the carotid artery and jugular vein. In addition, there are risks associated with any surgical procedure, such as infection, bleeding and an allergic reaction to the anesthesia. What are the benefits of VNS for epilepsy? Is it a cure? VNS is not a cure, and the total elimination of seizures is rare. However, many people who undergo VNS experience a significant (more than 50%) reduction in the frequency of seizures, as well as a decrease in seizure severity. This can greatly improve the quality of life for people with epilepsy. Reviewed by Brunilda Nazario, MD on October 29, 2009. Last reviewed on October 2018. Depression in the elderly is very common. That doesn't mean, though, it's normal. Treatment may involve antidepressants, psychotherapy, or electroconvulsive therapy. Migraines are a type of headache and seizures are the main symptom of epilepsy. Migraine headaches and seizures are two different neurological problems that have similar signs, symptoms, and auras, for example, sensitivity to light (photophobia) and sound, irritability, nausea, and vomiting. Symptoms unique to migraine and migraine auras are water retention, problems sleeping, appetite changes, and talkativeness. Symptoms unique to seizure and seizures auras are depression, a feeling of heaviness, a feeling that a seizure is approaching, and depression. Many of the symptoms of migraine and seizures are the same, however, seizures do not cause migraines; however, people who have seizures are twice as likely to have migraines and vice-versa. People who have migraines are twice as likely to have seizures, and people with seizures are twice as likely to have migraines; however, one condition does not cause the other.